Is there anything sadder? Besides the poem, that is. When the lamp is on, and the chair is warm, and the coffee’s gone, what do you do? Where do you go when there’s nothing there, not in your cup, not a drop to spare? What can you pray, to take the pain away, to smooth the rough edges of another rough day? What do you know that can whisper to your soul, the way the coffee does, when you’re feeling so low? And the loneliness is pressing, the wind whipping round, the chill to your bones, the stale coffee grounds. 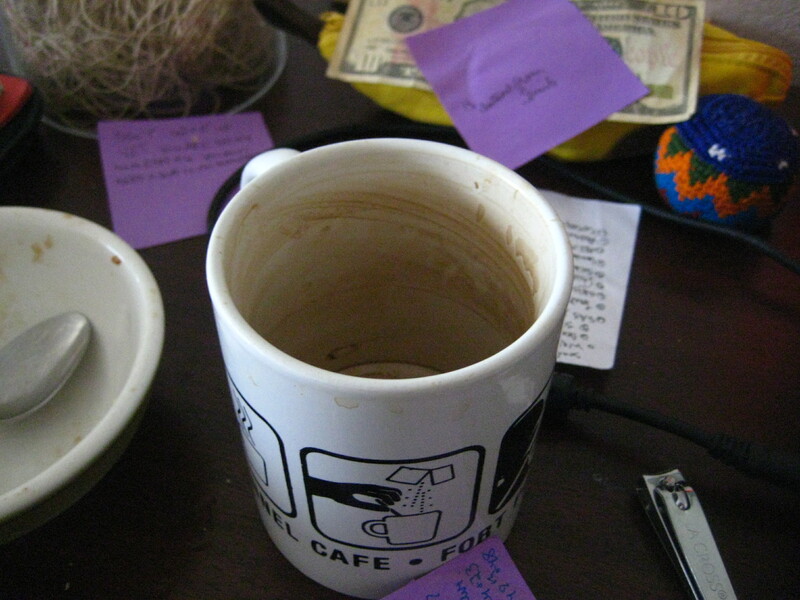 The dry brown ring, the sad coffee stain, the slight dampness mocks you and your coffee-addled brain. This endless white emptiness, the crushing heartache, the yearning and hoping as I’m lying awake. For a cup of coffee. Hot. No sugar. Just milk. Please. And thoughts will float between us, as they do between old friends. That is, as they do, before the coffee ends. Haha thanks a lot! And I would gladly accept it! This sings sadly and sweetly to my own coffee-riddled soul… Ah, bitter brew of my undoing! This poem is funny and sad all at the same time. I like that the coffee mug shows how to prep the coffee – cute. Because life is often both sad and funny.